I know you guys have been waiting for this update, so eagerly. This might have took weeks, but you know, I care you more than myself :). Here below is the result of my sleepless nights. Upgraded to latest v3.0 to support Mini Militia v2.2.16 with cool new features, please click the below link for that. Fully replaced the internal assets extraction code for devices with low processing power plus internal RAM. Added internal verification check code, that will do a check If the app's binary has modified by an external entity, for security purposes. Removed RevealedTricks4U logo from the main game play screen by request. Shrink'ed the app to a smaller size like 3 MB. See Downloads section at the end of this post. 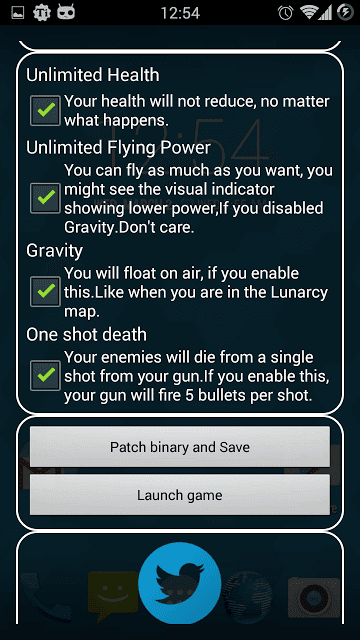 Please install the original version of Mini Militia v2.2.15 to continue with this app. I wanna explain this new app feature separately to avoid confusions in future.This feature was the major update, prior to the previous version of this app. This feature will fix all those problems and this feature will be executed only for the first time when you press the "Patch binary and save" button. 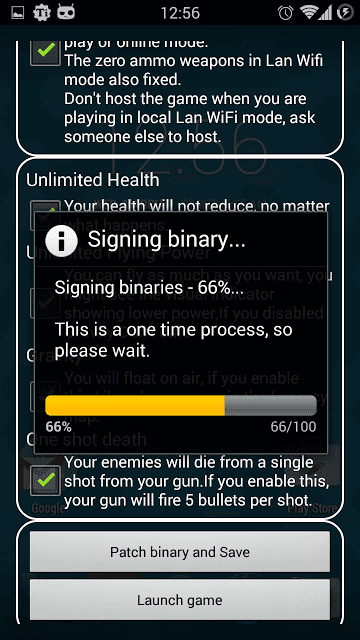 After you press the "Patch binary and save" button, there will be a check to make sure the app's signature is proper or not, If not then this feature will be executed and the below screenshots are self explanatory. Once again, this feature is a one time process and you've to wait until all the steps completed.It won't repeat unless If there an external modification happens to the game binary. Above pictures are self explanatory, but I will explain it once again for you guys. Pro Pack - Now you can access all pro pack content available in the game like pro pack weapons in Quick play mode and all kind of avatars. (Make sure you've bought the last item from the STORE to get Pro pack avatars). No Reload - You don't have to wait for each reloads. (Only useful, when you disable unlimited ammo, as there will be no reload). Unlimited Ammo(UPDATED) - This is one of the major update from the previous version, as this will enable you to take or drop weapons or throw grenades while playing in Online or Quick play mode without CRASH or FREEZE. From the above pictures, you could see for yourself, that the app is totally different from the previous version in its graphics. Used Multi-Threading technology to remove hangs or lags. Optimized coded for low end and high end devices. NOTE - This will app will remove the existing Mini Militia app and replaces with a patched binary, so that current game data will be reset. (Use Droid cheat kinda app to get unlimited experience and other things). 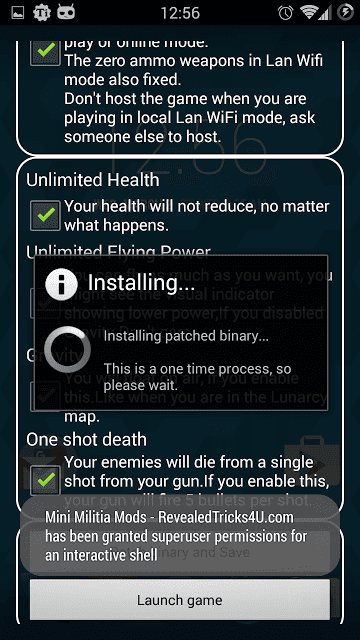 MiniMilitiaMods-v2.4-Final-RevealedTricks4U.com.apk(3.8 MB) - Once again, please reinstall the original version of the Mini Militia v2.2.15 before continuing with this app. - Click on Skip Ad after clicking this link, to get the download page. App would automatically deselect the previously selected options after a restart. (Thanks to my brother for finding it out). Changed a typo error, which causes repeated One Time process. Fixed force closes and other problems in the Lollipop roms and on some other specific devices. (I would really like to thanks and appreciate SAMEER VARMA for allowing me to access his Lollipop device, remotely and for his patience, while I was sorting out the problem). Please move towards the top part of the post to see that. Please let me know through comments. That's all from me and stay tuned for an updated version for Mini Militia v2.2.16. Signing off..., take care guys. 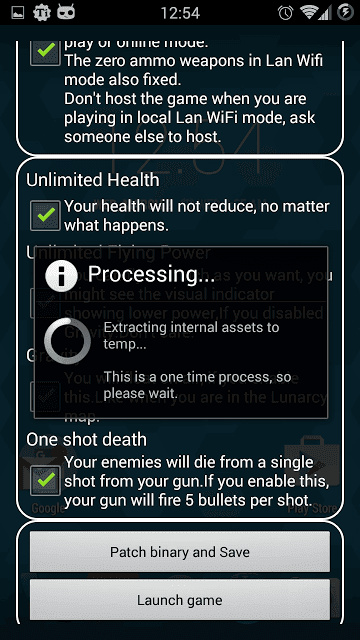 This update is for the existing Mini Militia app v2.2.15 with cool new features. Please don't update the app from v2.2.15 as this won't work in the latest version. I am still coding for the latest version of the app. Stay tuned and subscribe to get the latest updates right onto your mailbox. Stay tuned for the mod for latest version of Mini Militia, that is currently v2.2.16. In the next update, there will be a box to enter the number of bullets fired per shot.So that you guys can enter a value.You may change the value on the basis of, How many shots you use to kill your enemies. Thanks for the suggestion and don't forget to subscribe, If you want the future updates right onto your mailbox. The application updated as per your requests, I just need you guys to be happy with my programs :D.
Thanks soo much bro. I too replaced the png's in hd hdr and sd folders in assets folder recompiled and signed the apk and by the time I completed the process you already updated the app as per our request ;) You are such a good person bro. Waiting for further updates. I thought of writing codes to do on the fly image editing while the program is running, that's more complicated for those who just change the image files ;). I appreciate you, being active giving bug reports and other suggestions. Bro why a i unable to sign in to my google account in this game. And i am unable to play online using google+. Its not even signing in to google+. Maybe it's because of the pro pack authentication you may have removed the google signing in. Can you figure out another and make it sign in in next update? Thanks in advance. And moreover when i have done everything that you mentioned above and after changing my experiece level and kills etc by modifying cocos2lib.xml, the toggleble version says that you are using mini militia modded version please reinstall the original version from play store. And then find a file called Cocos2dxPrefsFile.xml and you may modify according to your need. The all above mentioned procedures were already done in an app called DroidCheat, which is used to modify the preferences easily. My app never checks the consistency of the Mini Militia data file, it only checks If the Mini Militia apk or installed binary has been modified or not, mainly for security purposes and compatibility. And I did'nt checked the Google sign in yet, lemme check it and ping you guys back.
" Unfortunately mini militia mods - revealedtricks4u.com has stopped "
I received your screenshots and logs. After analysing, I have patched the binary. Please go to the Downloads section and download the updated app and make sure you've read the bug fixes. After patching it shows Signing 100% completed, then it will uninstall the current version of the app and Installs the modded version of the app, and this is one time. Kindly do the steps below. 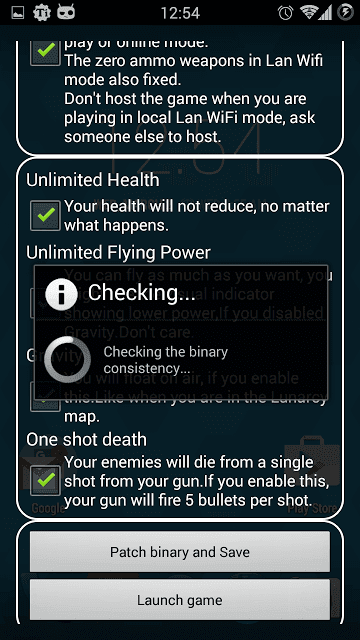 1)Remove all instances of Mini Militia game plus the toggle app. 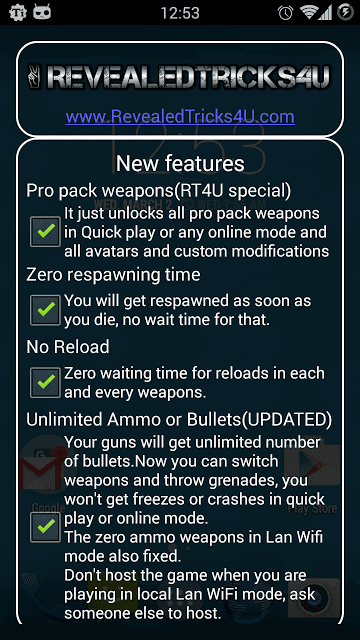 2)Now download and install the original Mini Militia Apk v2.2.15, If u can't find the download source, then just use this trusted site apk-dl.com to download previous versions of Apk. 3)Then install the latest updated version, make sure you've downloaded the latest version from the Downloads section, as this app is getting updated hour to hour. Feel free to talk more, If you are still facing issues. But still its getting while pathing.. The app has been updated, 3 minutes ago.Please download it as there are lots of changes has been happened. The whole patching process may take more than 10 minutes, it highly depends upon your phone's processor speed and current RAM availability, as it does intensive operations in background. Kindly wait until the process completes, If it takes more than an abnormal amount of waiting time like 20 minutes above, then please feel free to PM me through the Contact Me page. And also make sure you've got like atleast 100 mb free space in your internal storage. Please send me the log files zipped from the folder named rt4u in your Internal memory through the Contact-Me page. I wanna analyse the nature of the problem. Oh yea, and don't be hesitated to tell anything to me and I never take it it in the negative side. Please download the updated app from the Downloads sections, update 1 minute ago. Don't forget to read the Bug Fixes section to know the reason for the update. I have only 1 request for you shihab bro.. The application has been upgraded to v2.3 and I am damn sure that it will work on your phone.As you can read the change logs by yourself from the top of the post. Please feel free to PM me, If it still did'nt worked. I Dont see the Invisible option to the mod could you add the feature to 2.2.15 or to the newest version 2.2.16? You can't hide your skin or character from the others, because the server just syncs your body, positions and movements, not the textures you've modified in your phone. But you may hide your skin to a transparent one, its just a matter of editing some png files. But it only hides the character from your skin, not on other's screen. Hope you understand, what I explained above. Yeah... I Understand! are you able to create an Aimbot for Doodle Army 2? The mini militia togglble mod v.2.3 is working great..
After v.2.3 mod shows " successfully patched"
"Unfortunately app has stopped "
It seems you've a ROM problem, Mini Militia game binary is getting force closed especial v2.2.15 and below in some Lollipop Roms. Have you ever tried downgrading your ROM and try opening the game binary, as you've already shared your device info(PM) with me, I think your device has some ROM issues, try downgrading it. I suggest you to capture some screenshots and log files(in your Internal memory's rt4u folder) to my Email. Some Lollipop ROMs making issues with Mini Miltia binary, also you may try downgrading the ROM(Just in a worst scenario, if nothing happens). I have mailed you with the log for game being uninstalled during patching on lollipop issue. All the best on solving it. I've got your Email and sent a reply over there. Please find the latest version, that is v2.4, and I have fixed the problems that happens in Lollipop roms and other devices. And don't forget to read the Bug Fixes section. Why after patching it says no game found please install mini militia. Please help me. Im running stock android 4.1 pls. Patching took so long like 30mins or more so i cancelled it. Its my pleasure to help you guys out :). The 2.4 update fixed the game being uninstalled on lollipop error. This toggle app only works for rooted device, you may find my previous posts, that I've released modded game apk. You may download that and replace the current game binary. Please update your game app to v2.2.16 and update the mod app to v3.16 from the homepage. Please refresh this page or click the below. Can you modify the store items like changing the speed of health recharge by 100x and longer boost. I thinking for this plan because some people can't use the toogle'able mod that you make. If can, just remove all the mod that you have make and just modify the store. Because we can't even change weapon online mode(QUICKPLAY). Modify all the items in store to God Mode. I'm sure more people agree with this plan. Only modify the store. I'm sure you can. You're the best hacker I ever heard. Please remove all the mod you make and just modify the store like changing the speed of health recharge to 100x. Longer boost. Please do it for me. Add another post for Mini Militia Hacked Store Item. I need it. It's become more boring when having unlimited health. I only need the store that have health recharge speed to 100x and many more item like god mode. I hope you can make it. I'm sure more people want this. i did try to do this and my phone crashed any help? Does the device need to be rooted in order to make this application to work? I have installed but it is asking to root?? How can I done this?